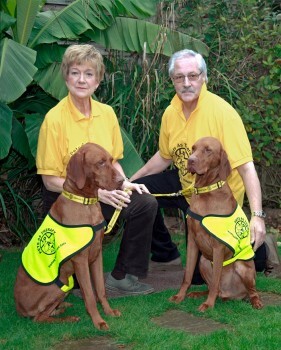 Pets as Theraphy is a national Charity founded in 1983. It is unique in that it provides therapeutic visits to hospitals, hospices, nursing and care homes, special needs schools and a variety of other venues by volounteers with their own friendly, temperament tested and vaccinated dogs and cats. There is now, also the provision for homoepathically pretected dogs to be included included in the scheme. This is a community led charity which thinks nationally but acts locally, particularly in respect of vital fund raising activities. Not every dog/cat can be a P.A.T. dog/cat and not every owner has the time to undertake regular visits. However, the charity is working hard on a day-to-day basis to recruit and register more suitable dogs/cats and their volunteer owner, to swell numbers and meet demands. Since its beginning, over 25,000 dogs have been registered into the Pets As Therapy Charity. Every year some of these retire and new dogs, having first been examined and passed on health, temperament, suitability and stability grounds, join as Pets As Therapy. Today there are currently around 5,000 active visiting Pets As Therapy dogs and 100 cats at work in the UK. Every week these calm friendly P.A.T dogs/cats give more than 150.000 people, both young and old, the pleasure and chance to cuddle and talk to them. Anthea and I passed the assessment programme 4 years ago with Troy and Cez for Pets As Therapy and have been registered volunteers with P.A.T. since that time. Although we had initially intended to visit Headley Court MOD Hospital at Leatherhead, there is a waiting list for P.A.T. Volunteers to get into the MOD establishment so we shall just have to wait our turn. It is such a shame that due to the unpredictability of the emotional reactions from children, patients and older residents receiving visits from pet dogs, that it was felt by several senior executives of hospitals, nursing homes etc, that from their previous experience, more harm was done than good as it brought back memories for those patients who were either separated from or lost their beloved pets in years gone by and therefore we were unsuccessful in securing a Pets As Therapy programme at a Worthing based Hospital for Ex-Servicemen, St Barnabas Hospice Worthing and the Chestnut Tree Childrens Hospice Nr.Arundel. However, it wasn’t long before we secured a Pets As Therapy programme with the Oak Grove College, Worthing for children requiring Special Needs who have learning difficulties. There are approximately 180 students ranging from 7 to 14 years of age. Some of the classes may only have a small number of children depending on their ability to learn and development of personal independence. We have been extremely privileged in working with small groups of young teenagers, under the supervision of specialised teachers, to assist in developing the confidence, intercommunication skills including helping them overcome their fear of dogs. When we started with Troy and Cez, there was a small class of just five 13 year old boys. We introduced Troy first to the young students and spent about 40 minutes with them and then swopped over to Cez for a further 15 minutes, the session lasted for about 55 minutes in total. One of the students, pseudo name Bret, was petrified of dogs and could not take his eyes off either of our Vizslas in the classroom whilst keeping a safe distance between them and himself of some 20 feet with a desk in between as a barrier. After encouraging the other students to offer titbits to Troy and slowly building up their confidence being in the presence of a dog, I hoped this would encourage Bret to get a little closer. Within 20 minutes of introducing Troy to the class, I coaxed Bret just to touch the end of spare second lead which was at full stretch from the attached collar to Troy, ensuring I maintained full control at all times with the other main lead. Bret gave a nervous laugh of achievement whilst the teachers looked on with amazement. As the afternoon session progressed the students slowly and surely gained more confidence and now keen to offer more titbits. After walking round the playground and allowing each student in turn to hold the second lead, still attached to the collar, I hoped that Bret would feel that he was being left out, which proved to be the case. Sure enough, I asked Bret to join me and take Troy for a walk, very hesitantly, Bret agreed. With his arm stretched out as far as he could reach, he tentatively held the end of the lead in his right hand and off we went completing a full circuit of the playground. This methodical and gentle process was repeated when I introduced Cez to the students in the playground. Once again Bret impressed us all with his achievement in such a short time by taking Cez for a walk along the same route but still keeping his eyes firmly fixed on Cez. 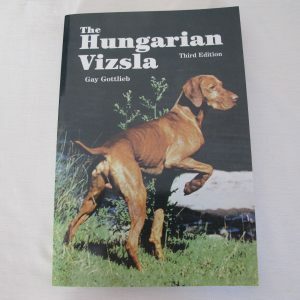 The Hungarian Vizsla is an amazing breed which are so sensitive and able to adjust at the flick of switch to people with varying disabilities. The two Teachers were also very impressed with Troy’s and Cez’s gentleness and willingness to accommodate in the new surroundings. The following week during our visit to the College we received very positive feedback from the Teachers and the student’s Parents. In the afternoon we managed to encourage Bret to give Troy and Cez a titbit from his hand rather than the pieces of biscuit being thrown across the classroom or playground. Just before leaving that afternoon, we were asked if we would like to take Troy and Cez to another class on next week’s visit as other Teachers have expressed an interest in bringing Troy and Cez into the students curriculum. We started when Bret was petrified of dogs and to see him progress and overcome his fears has surprised us all. We so pleased that Bret takes Troy and Cez, each in turn, for a walk every week around the college playground and is now quite comfortable in giving the dogs titbits from his hand. The icing on the cake at the end of term was for Bret to allow the dogs to give him a kiss on the nose. This is an amazing achievement for a young lad with his condition. The teachers and the boy’s parents are astounded by his progress and in particular when Bret is out walking around the shops or park, he is keen to meet other dogs but is still cautious, and so he should be. We are continually teaching students how to treat dogs with kindness, warmth and affection which Bret finds very rewarding. During another term at the school one of the teachers was uncertain as to how the children in her class would react and how they could be helped by the presence of dogs in the class room. After 4 weeks the progress again is amazing which has helped the children to be more communicative with each other and the teachers. However, one child had not spoken to anyone for two days and did not participate in any of the class exercises until we arrived with Troy and Cez when she suddenly came to life and didn’t stop talking, the teacher told us that she was gob smacked to say the least. We and the teachers and especially the children thoroughly enjoy our visits, as so much is being gained through confidence building and to see the happiness on the children’s faces. It all makes it so worthwhile. We now have another class of six students who require greater care and help to overcome daily problems that you and I take for granted. Is your Vizsla suitable as a P.A.T. dog ? Have a look on the P.A.T. WEB site and give P.A.T. a call to find out what is involved.